May is surely correct about this. A morality based in respect for others, and in recognition of our duties and obligations to others, underlies most of the defensible arguments favoring nonviolence. (The major alternative, a utilitarian morality based on outcomes and consequences, will forever argue that the ends justify the means, even if the means are violent.) The Golden Rule “do unto others…” and biblical admonitions to “love thy neighbor as thyself” are based on this type of reasoning, called Kantian or deontological. At the philosophical level, then, the challenge is to convince ourselves and each other that deontological respect for our fellow human beings is itself a concept worthy of respect. To put it mildly, this is not so easy. Everyone from Confucius to Jesus to Gandhi has tried. Yet “peace on earth, goodwill to men” still sounds like a pipe dream, lovely words that have no bearing on real life. Even the many of us who claim to accept this precept often act otherwise. Why does this perspective, favored by virtually all world religions — as well as secular humanists — and argued most compellingly by our greatest thinkers, nonetheless fail to gain traction? The answer to this central question of human existence: psychology. Sadly, we humans don’t always behave sensibly. Our feelings often precede and even dictate our thoughts. This was first brought home to me when, as a college student witnessing a political protest, I suddenly realized that the emotional fervor expressed by both sides had very little to do with thinking the issue through. Indeed, it seemed people who understood the subject the least had the strongest feelings about it, pro or con. Moreover, it appeared that people become emotionally invested first, and only later bolster their positions with post-hoc reasoning. Around the same time, I helped with a well-known psychology experiment on confirmation bias, our human tendency to grant greater weight to evidence that supports what we already believe. In the experiment, subjects who already had strong opinions pro or con about the death penalty reviewed exactly balanced “evidence” — I should know, I fabricated it — and reached opposite conclusions. That is, both sides felt more justified in their prior belief by weighing more heavily that portion of the evidence that agreed with their existing position. Those already in favor of the death penalty became more in favor, those already opposed became more opposed. Both the political rally and this experiment figured centrally in my decision to pursue a mental health career. Here was proof that people simply aren’t rational — and that’s fascinating. While fascinating, this reality bodes poorly for reasoned arguments aimed to influence others. As a society we argue endlessly over social issues: the role of government, whether private gun ownership increases or decreases one’s safety, the legitimacy of gay marriage, how we should treat undocumented immigrants. Selected (i.e., biased) facts, statistics, and images are lobbed back and forth. Those who already agree with a particular bias applaud; those who are opposed become annoyed and counter with facts, statistics, and images of their own. For the most part, everyone feels vindicated by their confirmation bias. Very few minds are changed. Nonviolence is an especially poignant case. Nearly everyone claims to be on the side of discouraging and decreasing violence, yet there is vehement disagreement over how to achieve this. Moral directives to “do unto others” or “love thy neighbor” are dismissed as naive. Here in the real world it’s “peace through strength,” “the best defense is a strong offense,” and “a pacifist is someone who hasn’t been mugged yet.” Violence is treated emotionally as axiomatic, a given, with post-hoc justification that “they deserve it” or “they started it,” or that committing violence now prevents more later. It is a necessary evil, an entrenched part of the human condition. In part two, I will pick up from here. Given that moral reasoning alone rarely changes anything or anybody in the real world, what can? Is there a meaningful way to promote nonviolence? This shows up in most cycles of violence, ranging from the Israeli-Palestinian conflict to gang violence in Chicago. There was a study done a few years ago (and unfortunately I can’t find the citation) that showed when Side A believes they are retaliating against a perceived offense in a measured and even way, Side B would perceive the retaliation as an unbalanced escalation, and then proceed to try to balance things by retaliating, which of course Side A then perceives as an escalation. Another factor that’s not discussed much is that media coverage of violent acts is so over-the-top dramatic that this focus on violence can promote more violence. As Roger Ebert once said, “Events like Columbine are influenced far less by violent movies than by CNN, the NBC Nightly News and all the other news media, who glorify the killers in the guise of ‘explaining’ them.” Not surprising, there’s not much media coverage of this perspective. So basically, a really tough problem. 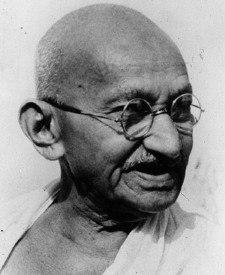 I can’t wait to hear more about your thoughts on how to promote nonviolence in our society. I’m fascinated by all those Rules! I had no idea there were so many variations. Recently I came across another version, which might be germane to this discussion; said by the crucified and risen Jesus, “Do unto to others as I have done unto you.” Regardless of whether or not one is a Christian, here is an idea that the model for how we treat others is found in emulating the very highest standard, not just ourselves or our neighbors.